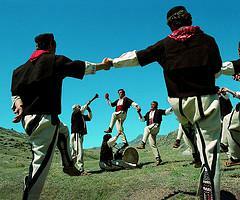 Fans of Macedonian folklore will be able to learn authentic dances, preserved until today on the territory of Macedonia. Macedonian rhythms and steps will be presented in authentic Vardar style – typical dances for the region and specific style of performing of some folk dances popular around the whole Macedonia. The workshop is suitable for beginners and advanced dancers. Sasko Anastasov (Republic of Macedonia) - Artist of Macedonian folklore, Choreographer of Ensemble "Vila Zora" - the town of Veles, Teacher at seminars for Balkan folklore in many countries all around the word. Folk night (Garibaldi Square) – at 20.00 – live music, dances, demonstrations with drum, dinner and drinks. Dress code – folk outfit is recommended.